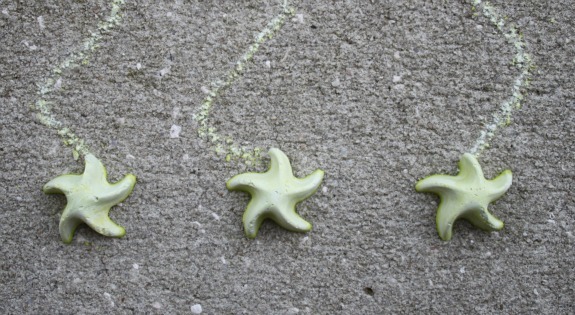 Do you know how to make your own sidewalk chalk? It’s easier than you think! We have made sidewalk chalk many times before and now we have come up with a glow in the dark sidewalk chalk recipe. It may be the most fun yet! Coat the ice cube tray lightly with the petroleum jelly and set aside. Mix the Plaster of Paris, the water, the food coloring, and the glow in a container that you were going to get rid or or recycle because you won’t be able to use it again. Spoon the chalk mixture into the ice cube tray and place in a cool dry place to dry over night. When the chalk is completely dry it is ready to use! When your sidewalk chalk is ready go outside and draw! 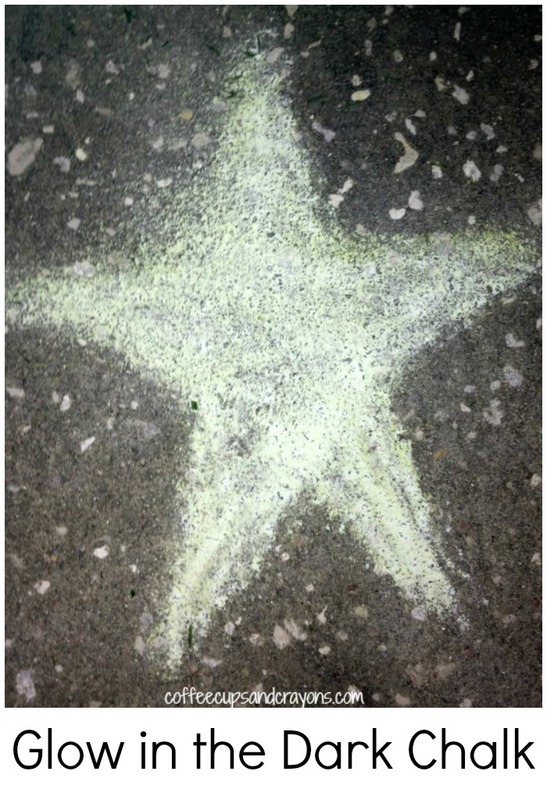 Glow in the dark sidewalk chalk has a fun glow to it when it’s dark and is a lot of fun for kids. For more fun summer ideas check out our “Old School” Summer Bucket List! No way! This is awesome! The other night we were at my sister’s for the 4th and the kids were doing sidewalk chalk. I was thinking, “I wish this stuff was glow in the dark.” And now I know how to make my own. You rock, Megan! Is the green coloring gel needed or is it just for looks? Can we use any color we want or even none? just wondering if it washed off well? we want to do it on some concrete walls but need to return the venue back to clean! Thanks! It washed off very easily from our concrete driveway, but I didn’t try a wall. I’d test it if you have time to be sure if you’re using a bright color though. Have fun! I love this idea! Our four 3 year-olds would have a blast with that chalk. I pinned it Please share on Artsy Play Wednesday. I’d love to include this post in our 4th of July round-up. Your star picture reminds me of the 4th and I think would be a great children’s fireworks drawing activity. I am terrible about remembering to come back and link up to things when I’m on the computer! If I forget you are always welcome to use it in a round up! I love this idea! We wanted glow chalk for a night time, outdoor party and couldn’t find any. I just made a batch and it is not glowing at all (although the paint itself does glow, so I know it is “charged”). Does it take longer for the chalk to start glowing? Thanks! Once ours was hardened it worked. Although….while it was drying I had it sitting in a sunny window each time I made it! I wonder if that made a difference??? It also showed up much better on blacktop than concrete. I’ll leave the light on tonight while it’s drying and hope for the best. Thanks for the advice.